Contemporary Scottish Artist, Gerard Burns has just released his painting of prominent Clinician and Founder/Director of the Glasgow Memory Clinic, Doctor Fraser Ingles, to coincide with National Armed Forces Day, as all proceeds from the painting will be donated to Erskine Veteran’s Charity. 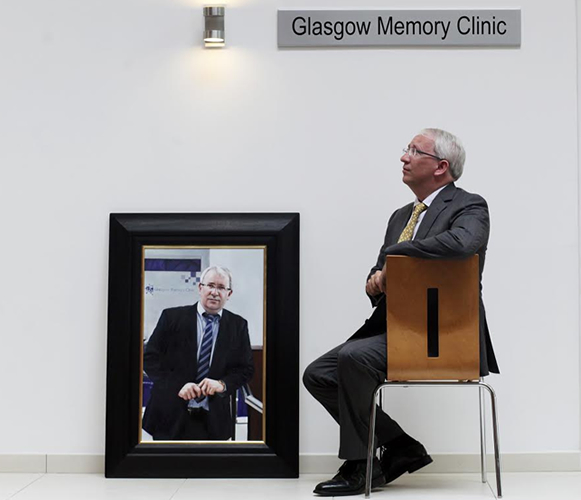 Fraser’s portrait is one of 14 that will be part of his “14 for 14” multi charity, fundraising exhibition that will take place in The Banking Hall in Clydesdale Bank’s head office in St Vincent Street, in Glasgow, this July, during the Commonwealth Games. Gerard, who regularly donates his paintings to charity, thought that his own contribution to 2014 would be to organise a multi-charity event that celebrates each significant character he has chosen to paint whilst raising funds for each of his sitters’ chosen charities.